#51 TRIPOD LEGS EXTENDED HEIGHT 89"; LEG SPAN 66"; DIST. 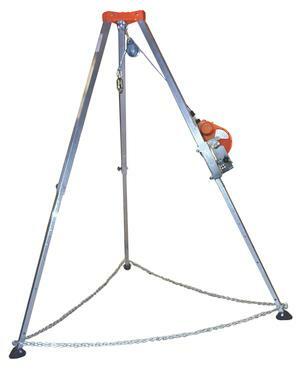 BETWEEN FEET 58"
#M52 MOUNTED RECOVERY SYSTEM MAX WORKING LOAD 300 LBS; CABLE SIZE 3/16"
ARRESTING FORCE 1200 LBS; LIFELINE SYSTEM STRENGTH 3000 LBS. INERTIA TYPE-FRICTION DISC; MIN LOAD 75 LBS. ; UNIT WEIGHT 28 LBS. * Please call us for any questions on our confined space unit 50 foot rentals in Cincinnati Ohio.